With Luxury throughout we truly belive you will not find a better home for your next trip to Florida. Watch a movie in the private movie theater, play in the custom arcade and games room, swim in the 60ft salt water pool, cook a family banquet in the custom summer kitchen or relax in the multiple living spaces. From 7 bedrooms to choose from, there's room for your entire party! This home really does have it all. CLICK HERE TO VIEW OUR FULL ONLINE GALLERY! Technology is at the forefront of the home with a movie server featuring a selection of over 500 movies at your fingertips in every room, zoned audio throughout and super fast internet connections. Every room has a flat screen TV for your enjoyment. The huge family room is the real hub of the home featuring an 85 inch flat screen TV and ample seating for everyone. Luxury leather sofas and a contemporary decor can be found with doors directly to the pool deck. The 2nd loft living space features another large flat screen, comfortable seating and a great second place to relax. The gourmet kitchen includes 3 ovens, huge gas range top, large fridge/freezer and every gadget you might need. Informal dining can be found at the breakfast bar. The custom dining table made from solid stone can seat 12 in comfort. This impressive home offers 7 bedrooms and sleeps 16 people in unrivaled comfort. Every bedroom is a suite in itself with luxury bed linens and 5 star hotel quality mattresses. 5 bedrooms feature King Sized beds and the remaining two bedrooms will have two Queen beds in each. Two are located downstairs with 5 on the 2nd floor. This home features 8 bathrooms, 7 of which are ensuite. Each of the 7 bedroom suites feature their own full bathroom with double vanity, shower, large soaking tub and are fully tiled. Luxury towels are provided for your use. The custom games room will have a full size pool table, air hockey and foosball table alongside a large seating area with flat screen TV. The games arcade will include an arcade style driving machine, retro arcade box with games from the 80s and dual TV screens for battles on X-Box and more. Outside the custom built pool is over 60ft long and the largest we have seen with ample loungers. A separate spa with weather proof TV is provided. The summer kitchen has Lynx appliances throughout and includes the gas grill with rotisserie, fridges, ice maker, oven, oversized grill and much, much more! Outside seating is provided both at the bar and a custom make granite table. A contemporary gas fireplace is also locate din the dining area for cooler evenings. Lightning fast internet and extended WiFi is available throughout the home. We have everything you might need for little ones for your use - push chairs, high chairs, baby monitors and more. Formosa Gardens Estates is arguably one of the closest communities to Disney World. 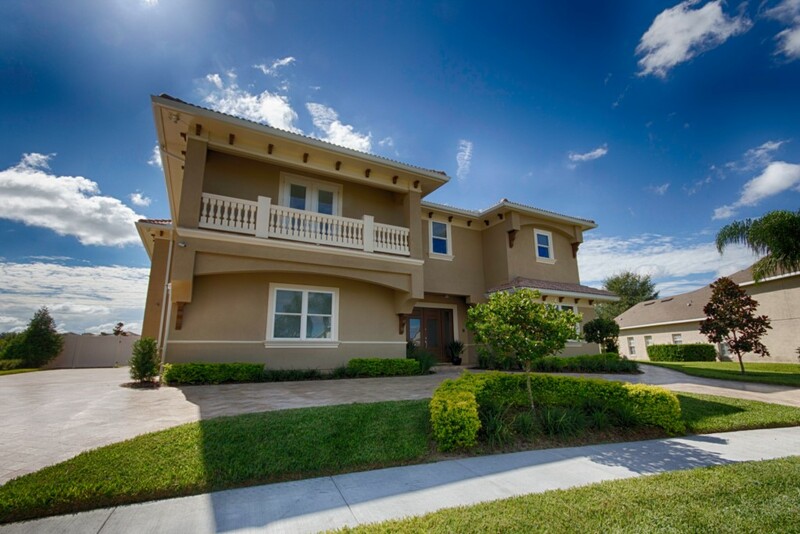 This luxurious, gated community features some of the best homes in the Disney Area. This executive community is an ideal holiday location for families. Formosa Gardens Estates is located off Hwy 192 in West Kissimmee at Mile Marker 4 - less than 3 miles from the Disney theme parks, so that you can be first in the gates each morning! Just a short drive away, you'll find an array of top-quality shops, bars and restaurants such as Buffalo Wild Wings, Outback Steakhouse, Texas Roadhouse, Red Lobster, Bonefish Grill, Longhorn Steakhouse, Bahama Breeze, Olive Garden and Manny's Chophouse ... just to name a few!